T-250 - This stands for thread count. The thread count is the number of horizontal and vertical threads in one square inch of fabric. The higher the thread count the softer the pillowcase will feel. 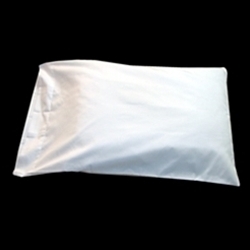 These pillowcases are commonly purchased by crafters, hotels, motels, camps, prisons, nursing homes, hospitals, and other types of facilities.